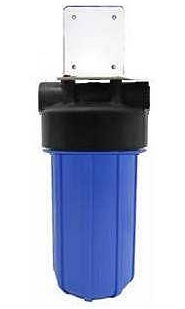 So-Clear Whole House Complete Filter Replacement Kit w/Tank: This one is as easy as it gets! You will receive a new tank with media inside and ready to install. Simply unscrew the used tank from the installed tank head. Then screw the new tank into the installed tank head and you're done! 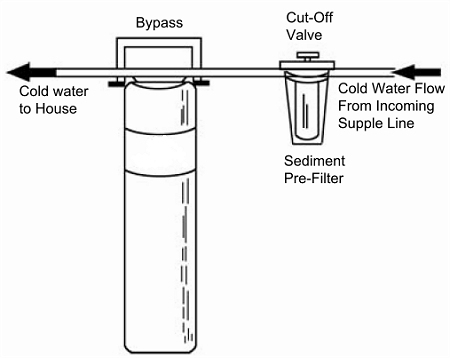 The diagram below shows the cold water coming into the house passes through a Sediment Pre-Filter and then the So-Clear Refillable Whole House Water Filter. From there, the filtered water flows into the rest of the house including the water heater, refrigerator, kitchen, bath and sink faucets, and (in some cases) outdoor spigots. Like most filters, our So-Clear filters are for use with public water systems. Please contact AbundantEarth.com for a quotation on a custom tailored whole house well-water system. For maximum filter life and effectiveness, your So-Clear Whole House Water Filter System comes complete with a Whole House Sediment Pre-filter with a 20-micron filter. Please note sediment filters will likley need replacing more frequently than your Whole House Filter depending on your water quality.